In the first week of January 2001, I spent several days at the Seth Peterson Cottage, on Mirror Lake in Wisconsin. It was designed in 1958 by Frank Lloyd Wright, and was one of his last commissions. The cottage has been restored to its original specifications under the stewardship of the Seth Peterson Cottage Conservancy, and is available for guest lodging through the Sand County Service Company. I've actually stayed there twice, once in the fall and now in the winter. Eventually I would like to stay there in all four seasons. I took a lot of pictures this time and, although I'm not much of a photographer, the natural grace and elegance of the design still shows through. All pictures were taken with an old Olympus FTL single lens reflex camera. Film was processed and digitized at PhotoWorks.com. Roll #1. Photos of the interior and exterior brick work and clerestory. Also several shots of the bench seating, which is quite comfortable. Notice the poinsettias and Christmas tree, placed for the Holiday season. Roll #2. Some good closeups of the fireplace. In spite of its size, it tends to let some smoke into the room, so I kept the fire small and pushed into the corner. Also several outside shots with an overcast sky. Roll #3. Night time shots with timed exposures. They are a bit grainy, but still convey how warm and cozy the cottage is. The interior floor is kept warm with a circulating hot water system. Kristin Visser, Frank Lloyd Wright & the Prairie School in Wisconsin: An Architectural Touring Guide , Madison: Prairie Oak Press, 1998. 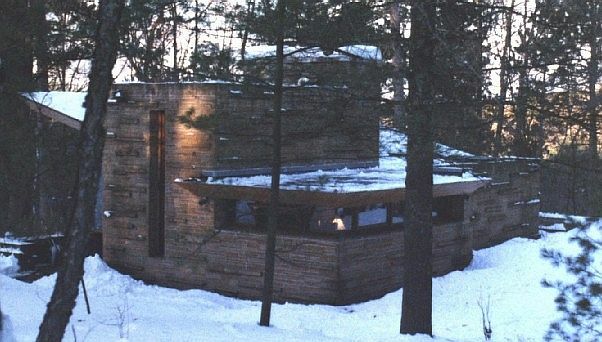 John Eifler, Kristin Visser, Frank Lloyd Wright's Seth Peterson Cottage: Rescuing a Lost Masterwork , Madison: Prairie Oak Press, 1999.